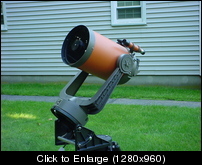 This is the first installment of my "Fix up my old, orange tube Celestron." I recently received a late '77 or early '78 C8. It needed some TLC to be sure, but I was thrilled. I saw one in a camera store in 1978, ( the year I graduated High School) and I've wanted an SCT ever since. This particular scope was stored in a dirt floor basement for many years. The case was damp when it was rescued from that location. ARRRGH ! It was then left unprotected in a garage for a couple more years. A very kind fellow who knew he would never use it , gave it to a guy he knew who would, ME. Yip-pie ! Mechanically OK , but optics were scary at best. The corrector plate had a hazy film and lots of stuck-on dust inside and out. The primary mirror had a 5 to 10 mm colony of fungus at least every square inch. The secondary had fungus too, though not as bad. OK , so what now ? Start researching on the Web. In comes Chicago Astronomer Joe. Hallelujah ! Joe's posting on his cleaning and mods to his C11 gave me hope. I hope the optical surfaces can be brought back. The Corrector plate can take good "scrubbings" without fear of damage. Even if any coatings are damages by the contaminations, the corrector plate will still perform nicely with just a slight degradation of performance. The mirrors on the other hand, need a delicate approach, but in your case, more intense attention is required. You'll need to set a baseline before you start. Look at both daytime terrestrial objects and night sky objects...and see what they look like in the SCT's present condition. Note any hazing, blurring, specks and other detritus in the view. If you can take some handheld pics thru the eyepiece, it will serve as a good reference point....and you can compare the before and after cleaning views. When you are ready, open up the tube,( following my procedures to keep things orientated to each other), let it air out for a day. Use your nose to investigate the environment inside the tube. I'm curious to see the pics of the optical surfaces. 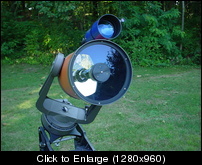 I did not have a visual back for this scope, however I did have a star diagonal and an assortment of eyepieces. I fabricated a visual back using parts from a plastic 2" focuser, a 1.25" eyepiece holder from a really junky turret, and a trip to the hardware store for a 2' to 1.5" PVC adapter. Some JBWeld and Krylon ultra flat black spray paint and presto, a 99 cent visual back. Naturally as soon as I had a clear night I was out collecting photons. The viewing that first night included Saturn, Mars, Venus, the Moon, Albireo, and M57. Since I was used to a 4.5" scope, I was VERY happy with the views I got. The moon showed some haze no matter how I focused. And overall contrast was not great. However, I was never ever able to see the Ring nebula from my light polluted suburb site. 8" of Celestron SCT let me find it in seconds. So, after that first night I am chomping at the bit to clean up this scope and start enjoying her full potential. Picture is showing optics at their worst, it wasn't that bad. Flash and reflections make it about 4 times uglier than reality. The pic helps a lot in seeing what you are going to deal with. It seems that the primary mirror is very dirty. Some would say leave it be, but I say otherwise. If...you are very careful and work slowly and lightly...you can bring that mirror back to a non-haze state. I would start with blowing off what ever you can, once you get it out of the tube. Don't use compressed air in a can. 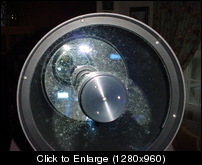 The propellants can damage the mirror. A bulb type blower is best and a brand new woman's face brush. I use one that is contained in a lipstick-like case. More later when you are ready for this step. Looking at your secondary....I'm not seeing anyway to adjust the smaller mirror. No knobs or screws...or is it the way the pic is taken? Might be a problem when you collimate later. I dig the homemade adapter you made and you can now compare before and after views. I followed Chicago Astronomer Joe's procedure as much as possible. First, I used a sharpie marker and indexed the position of the front cell and retaining ring. I unscrewed the screws holding the front cell retaining ring and removed the ring. I used the sharpie again to mark the location of each of the 3 cork spacers around the outside edge of the corrector. Using nitrile gloves I grabbed the secondary ring and pulled gently. The corrector came right out. Whew! Nice. I put the corrector in a pie box and hid it under my bed. then I removed the screws and nuts holding the front cell to the tube. The cell was stuck on good. It required some tapping on the rear edge with a dowel and a small hammer to loosen it. It was very snug but once it moved a bit I was able to slide it off. Next, I took apart the focus mechanism as Joe did. I removed the retaining clip in front of the primary and slid the primary off the baffle and out of the tube. Then I heard a clatter behind the mirror as it cleared the tube. It was the screw shaft of the focuser. it was attached to the primary holder by a slip fit brass yoke. No harm done. Next I will clean the tube inside and out, then play with the optics. Indeed, a scary time when first taking a SCT apart. It all sounds like it went well and just take your time. 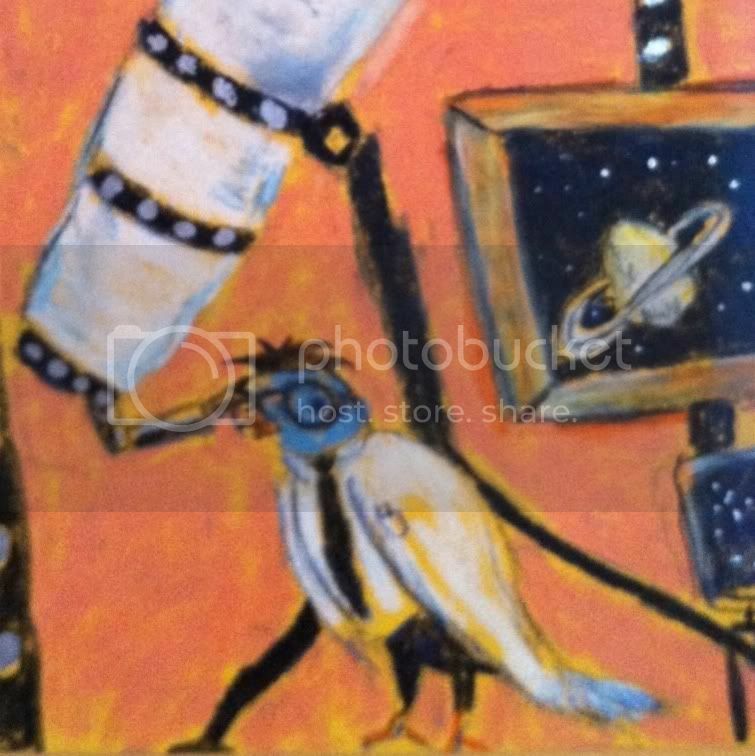 Attend to the mirror and corrector last, after flocking and stuff. Clean, clean and then....do some more cleaning of the tube before re-installing the optics. It seems that fuzzies and dust like to search for clean optical surfaces. The corrector plate takes a lot of abuse, so if at first, the gunk doesn't come off, a little extra pressure is cool. You could even soak the plate 1/4 at a time - edge up, to loosen and attack the debris. But, remember to blow everything off with air before anything touches any surface. After I removed the optics, front cell, and focuser assembly, I was left with the tube and rear cell. This was still mounted on the forks and resting on my kitchen table. " Finish this tonight." Externally the tube and mount were very dusty, some of which would not wipe off with a damp cloth. I used a Magic Eraser and the grime vanished with ease. This took a good hour to do. Lots of nooks and crannies in that fork. It looks great. The tripod had a fair share of rust on the legs. Another hour or so with a few rags and a can of rubbing compound returned it to shiny chrome again. I gave the inside of the tube and baffle tube a good wipe down two times with alcohol and paper towels. This very black, self-adhesive material is quite inexpensive. The cost for a 16 X 30 inch piece was under 15 bucks shipped. I measured twice and cut once, 12 X 27 7/8 inch would do it. When I got ready to install the stuff I realized that the baffle, a tube just about 9 inches in diameter, and my ten thumbs were going to struggle with one big piece. I cut my carefully measured piece into four 12 X 7 inch strips. I then peeled the backing off the first strip and starting at the back of the tube ,I layed it down coming out to the front. Protostar advertises this stuff as super sticky, and they are not lying. It is also easy to tear if you need to peel it up a bit to realign. Be careful. I ended up with one piece a little crooked, but no gaps more than 1 mm. I also now have a tube that is really black inside. 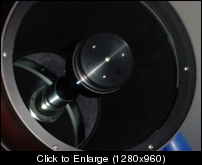 Protostar also advertises a stiff plastic sheet with the flocking on one side. The idea is you roll the stuff up, insert it into your tube and let it spring outward. Tension holds it in place. I would be tempted to try this stuff next time. Next installment; Clean the optics. Very cool, Karl, and welcome! Enjoying reading your adventure. Thanks for sharing and congrats on the new scope! Am sure it will be well worth it, and the two of you will be forever bonded. Cool to see a classic brought back to life!